David Oistrakh (violin) with Igor Oistrakh in the Ysaye. This is another winner from the BBC. The First Concerto, Op 77, was recorded in the Usher Hall, Edinburgh on 7 September 1962 and is a truly amazing performance both from soloist and orchestra. And the sound is very good. The opening Nocturne meanders a little too much but the playing is so exquisitely beautiful that one does not care. There are less of both the familiar Shostakovich trade marks and musical signatures in this movement which also has a passion that one does not always associate with this genius. I shall never forget Sir William Walton telling us that the greatest composer of the 20th century was Shostakovich. Just listen and marvel at Oistrakh's control and depth of feeling for this magnificent opening movement. It may occasionally sound like a tearjerker such as when vain Bette Davis finds out that the splendid Claude Rains (alias Mr Skeffington) is blind and yet can still say of his ex-wife, 'A woman is only beautiful when she is loved'. This is very special music. The second movement is a scherzo, often delicate and very clever. Here Shostakovich's humour is not the sardonic aggressive type one may associate with him but cheerful playfulness. Again it is very well performed. The central section is choice. To take just one simple point, the timpanist selects a variety of drumsticks and with great effect. His dry attack adds to the music's character. A little point but a very effective one. The piccolos are not as shrill as they can often be in Shostakovich. The conclusion to this movement is like the Witches Sabbath. Phew! The third movement, Passacaglia, is truly superb as music and so is this performance. The timpanist and his choice of sticks is again very wise and stunning. The music's argument is so logical and coherent in this account and Oistrakh's tone is impeccable. At times the playing is so moving that it is almost unbearable yet it is not slushy or sentimental. Note the sheer beauty of the high bassoon writing. Do you associate beauty with a bassoon? The counterpoint of the horn is another revelation. Whatever Shostakovich was he was versatile and extremely accomplished in all matters of form and composition. As a piece of music on its own this movement is a marvellous achievement. But why have I not noticed it before? It has never been played. like this in my hearing. A typical Shostakovich cadenza follows which begins thoughtfully. Oistrakh plays it as music not as a showing off or a circus act. The finale is a Burlesca and very exciting. Oistrakh avoids the pitfall of making it sound light and banal and therefore of no consequence. The variety is extensive. The joy in the music is not quite breathtaking but it is reminiscent of the finale of the Sixth Symphony. You do have the Fritz Reiner version with the Pittsburgh don't you? If not, why not? This Concerto finale is held in check. You know a terrific climax is coming and it may seem a little while but when it does come it is truly shattering. Irrefutably magnificent! I had to play it again straight away. The Second Concerto, Op 129, is different in that it has many of Shostakovich's clichés and yet it is probably the finer work. It is more mellow but not more beautiful. Again we have a large, slowish opening movement, a device that Shostakovich liked e.g. the Sixth, Eighth and Tenth symphonies. The solo part is more involved and its integration with the orchestra is very satisfying. Elements of the superb First Cello Concerto prevail occasionally as in the solo horn writing. It is often perky. This performance also benefits from a better conductor in the admirable Evgeny Svetlanov and the performance was given in RFH on 22 August 1968. Again the timpanist chooses his drumsticks wisely and yet this is a different orchestra and timpanist. The music heads towards a climax with episodic interruptions. One waits with great expectations and is not disappointed. My, those braying horns and the timpanist's attack and Oistrakh's playing is simply superb. The cadenza passage is very well judged. The solo horn passage which follows it is beautifully played and it is not easy! Oistrakh's tone is always impeccable. That could not be said, for example, of Menuhin who was not a good player any way. 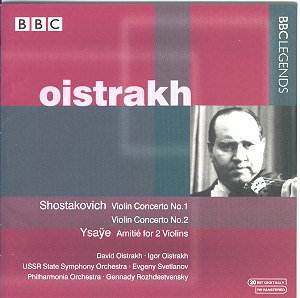 Oistrakh was the perfect violinist, brilliant, accurate but never showy. What would have been the result had Shostakovich written a Horn Concerto? There is a brief, slow introduction to the allegro finale with a sardonic horn. The music bustles along. The horn is kept busy and the variety of violin playing from Oistrakh is truly a delight. The timpani attacks are staggering and it is a good job that they are rare! The exciting music is almost too hot to handle. This is great stuff, really. Even the final cadenza sizzles with musical heat. The final minutes are breathtaking! Music of confidence and triumph. If you don't respond to this, you need professional help! The Ysaye is an anticlimax, interesting though it is and often quite lovely. And what good orchestration. But it is the two Shostakovich masterpieces that are the stars. There are some small coughs and splutters from the audience but this disc is a great success. You will not hear these concertos played better!